Use of large dose fractions in SRS and SBRT defied conventional radiobiology of oxygen-enhanced sensitivity of the tumor cells. The large volume tumors comprise of hypoxic core that is more radioresistant due to poor vascular supply to the core. In this article, we attempt to investigate the validity and applicability of the LQ, LQ-linear (LQ-L), and universal survival curve (USC) models for lung SBRT using published cell survival data of different cell lines of the lung cancers, and a unified LQ-L model is derived to predict high dose response for lung SBRT cases. where D is the single fraction dose, a and b are the coefficients of lethal and sublethal damages, respectively, and α/β is the tissue-specific parameter that implies the dose at which the components of lethal damage and sublethal damage, i.e. aD and bD 2, of the LQ survival equation, intersect. In the formulation of the equation (1) it is assumed that the double-stranded DNA breaks are sufficient enough to cause cell death. The double-stranded breaks can be achieved by single– hit or by two separate hits. The single– hit aberrations correspond to the lethal damage and two separate hits aberrations correspond to the sublethal damage, and are represented by aD and bD 2, respectively. where n is the number fractions and d is the dose per fraction. where BEDx is the BED for a fractionated treatment schedule delivered with a dose per fraction “x” other than 2 Gy per fractions. In the high dose range, the sublethal damage repair rate, per lesion, decreases and the production rate of the lethal damage increases with increasing the dose. This phenomenon is explained by various researches, considering high-dose saturation repair models.,,,,, This change in repair rate might be due to overloading of the repair enzymes, which may result in a different amount at different dose levels and might increase with increasing dose. Thereby at higher doses, the sublethal damage is not repaired due to overloading of the repair enzymes and hence the LQ model fails to explain dose-response curve. 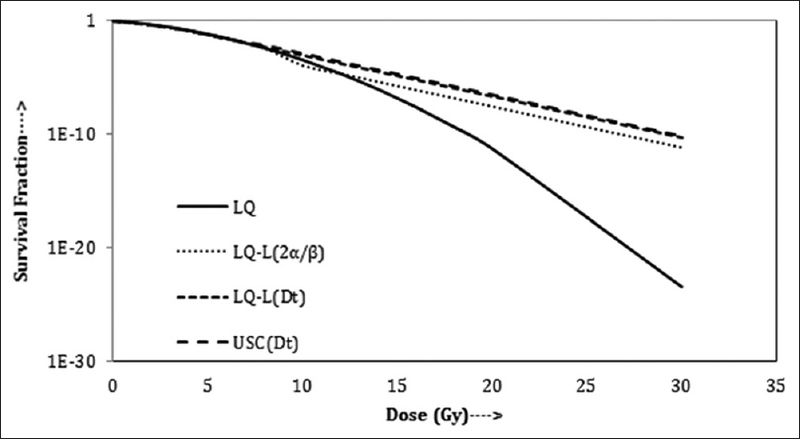 To explain radiobiological phenomenon, the experimental survival curves and clinical results in the high dose region, the LQ– L, and the USC models were developed by Carlone et al. and Park et al., respectively. where α and α/β are the LQ parameters, as explained in the previous section, and γ is the coefficient of the damage in the final linear portion of the survival curve at high doses. Equation (5b) reveals that the coefficient “γ” is the loge cell kill per Gy dose in the linear portion of the survival curve at high doses. This is a simple expression to calculate BED for high dose single fraction. where the first term, represents a single event to be responsible for an effect, corresponding to the lethal damage of the LQ model, and the second term in the square bracket, , represents that independent events are responsible to cause an effect, that is corresponding to the sublethal damage of the LQ model. The D1 and D0 are the initial slope ( first log cell kill) and final slope (constant fraction log cell kill) of survival curve, respectively. Park et al. have proposed a hybrid model, the USC model, by combining the LQ model and the MT model to enhance the fit of the survival curve data in a larger span. where Dt-mt is the transition dose derived using the MT model. At Dt-mt, the S of the LQ model also smoothly transitions into an asymptotic straight line of the S of the LQ-L model, which is tangential line to the LQ curve, and hence at this point of dose the S of the LQ model is equal to the S of the LQ-L model. Consequently, at transition dose Dt, the survival fractions of these three models are equal. Therefore, Dt-mt from Eq. (20) can be used into equation (7c) and equation (7d) to describe the S and BED for high dose fraction schemes. 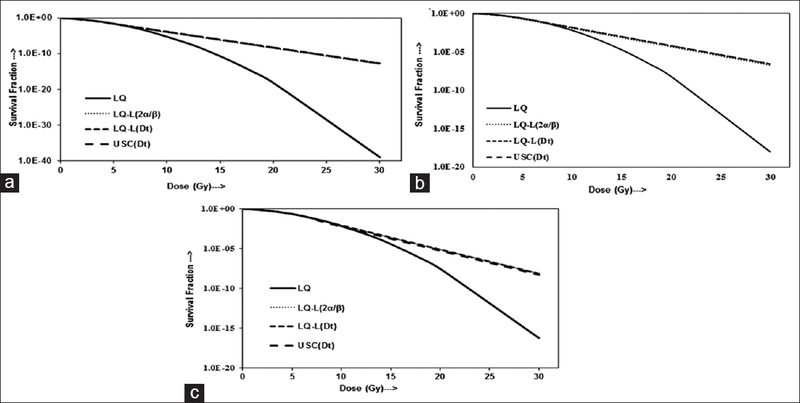 Seven and 15 in vitro radiation survival plots for human lung cancer cell lines were digitized from the charts of reports of Carney et al., consisting of 5 small cell (SC) and 2 large cell (LC) lines, and Carmichael et al., consisting of 3 SC, 3 LC, 4 adenocarcinoma (Ad), 3 adenosquamous (AdSq) and 2 squamous (Sq) cell lines, respectively. In both the reports the charts had been plotted with more than one experimental data. Hence, the digitized data were averaged for same dose point. The cell survival parameters, D0 and , and the LQ parameters, a and b, were extracted from the reports of Carmichael et al. for 8 SC and 12 non-SC (NSC), and Krarup et al. for 15 SC cell lines. The plots, the cell survival and the LQ parameters were grouped into two classes of SC and NSC lung cancer cell lines. The LC, Ad, AdSq and Sq lung cancer cell lines are the parts of NSC lung cancer cell lines, but to avoid confusion between data sets of different researchers, we used same terminology as was used by original investigator. The value of the LQ model parameter, a, for digitized cell survival data from the charts of the reports of Carney et al. and Carmichael et al., was determined by the best-fit regression method for low-dose survival data and b was calculated with an interactive inspection and chi-square best fit to the initial curvature points with R2 ≥ 0.97. The values of D0 and were calculated by the best-fit regression method to the final slope survival data, and are used in equation (20) to calculated transition doses. [Table 1] enlists the LQ and radiation cell survival parameters for SC and NSC lines. The parameters from [Table 1] were used to calculate the values of Dt-2α/β and , for digitized data set of the reports,, and to plot survival curves for the LQ, LQ-L, and USC models over the extrapolated range up to 30 Gy, shown in [Figure 1], [Figure 2], [Figure 3], [Figure 4], [Figure 5], [Figure 6], [Figure 7]. Two set of SF curves were plotted for the LQ-L model for transition dose denoted by Dt-2α/β, and Dt-mt, with same value of γ (=1/D0), while for the USC model it was done only for Dt-mt. The mean values of α, β, D0 and , determined from the digitized data of Carney et al. 's report, were found to be 0.75 ± 0.17 Gy −1 (ranged: 0.49–0.92 Gy −1), 0.06 ± 0.05 Gy −2 (ranged: 0.03-0.15 Gy −2), 0.85 ± 0.28 Gy (ranged: 0.48–1.20 Gy, and 3.1 ± 1.93 (ranged: 1.58–6.2), respectively, for SC cell lines; 0.13 ± 0.03 Gy −1 (ranged 0.11–0.15 Gy −1), 0.10 ± 0.01 Gy −2 (ranged: 0.10–0.11 Gy −2), 0.83 ± 0.06 Gy (ranged 0.79–0.87 Gy) and 11.94 ± 5.10 (ranged 8.33–15.54), respectively, for LC cell lines. The mean values of these parameters for digitized data of Carmichael et al. 's report  were 0.16 ± 0.12 Gy −1 (ranged: 0.07–0.30 Gy −1), 0.06 ± 0.03 Gy −2 (ranged 0.04–0.09 Gy −2), 1.41 ± 0.42 Gy (ranged: 0.98–1.81 Gy) and 4.59 ± 1.18 (ranged 3.2–6.6), respectively, for SC cell lines; 0.20 ± 0.05 Gy −1 (ranged: 0.15–0.24 Gy −1), 0.06 ± 0.03 Gy −2 (ranged: 0.04–0.10 Gy −2), 1.18 ± 0.28 Gy (ranged: 0.91–1.47 Gy) and 7.22 ± 2.79 (ranged: 5.28–10.42), respectively, for LC cell lines; 0.39 ± 0.30 Gy −1 (ranged: 0.14–0.79 Gy −1), 0.04 ± 0.01 Gy −2 (ranged 0.02–0.06 Gy −2), 1.25 ± 0.38 Gy (ranged: 1.02–1.82 Gy) and 5.21 ± 3.95 (ranged: 1.28–9.13), respectively, for Ad cell lines; 0.25 ± 0.08 Gy −1 (ranged 0.16–0.31 Gy −1), 0.07 ± 0.03 Gy −2 (ranged: 0.05–0.10 Gy −2), 1.25 ± 0.24 Gy (ranged: 1.01–1.48 Gy) and 4.68 ± 2.49 (ranged: 2.04–7.0), respectively, for AdSq cell lines; 0.29 ± 0.01 Gy −1 (ranged: 0.28–0.29 Gy −1), 0.05 ± 0.02 Gy −2 (ranged: 0.03–0.06 Gy −2), 1.07 ± 0.13 Gy (ranged: 0.97–1.16 Gy) and 7.94 ± 1.55 (ranged: 6.86–9.03), respectively, for Sq cell lines. Combined calculated values of α, β, D0 and parameters for SC and NSC cell lines for digitized data of both reports of Refs 43 and 44, are compared with that of extracted from the reports of Refs. 44 and 45, shown in [Table 2], with Student's t-test values. Further the calculated values of α, β, D0 and are combined with that of obtained from the reports, to get representative values of the parameters and are given in [Table 3] along with calculated values of Dt-mt. 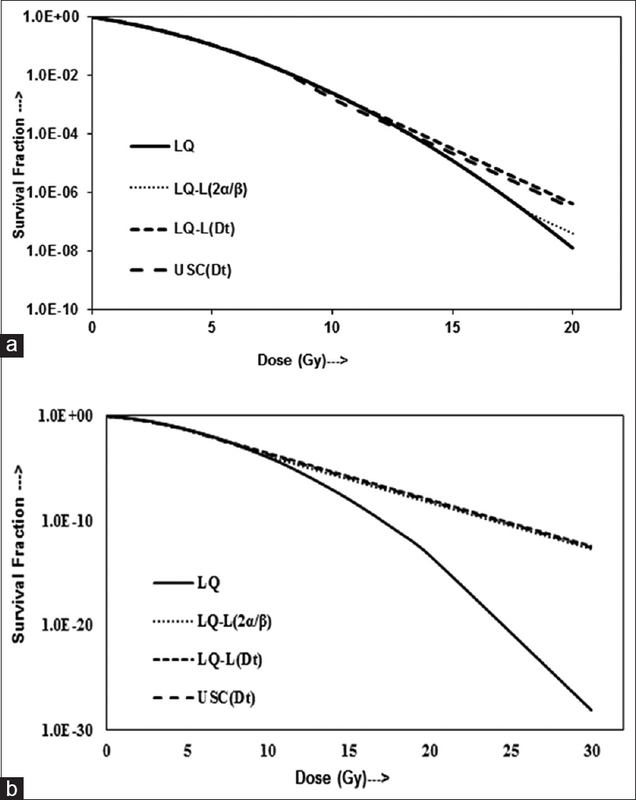 The parameters from [Table 3] were used to plot survival curves for the LQ, LQ-L(Dt-2α/β), LQ-L(Dt-mt) and USC(Dt-mt) models, shown in [Figure 8] and [Figure 9] for SC and NSC cell lines, respectively. The BED and EQD2 were calculated for fractionated SBRT dose scheme of the RTOG 0813 protocol from Level 1 to Level 9 (8 Gy to 12 Gy per fraction delivered in 5 fractions) using the LQ, LQ-L(Dt-mt) and USD(Dt-mt) models, for SC and NSC lung cancers. The values of representative parameters [Table 3] are used and are given in [Table 4]. The LQ model is well documented in the literature that it adequately describe the survival curve in low dose fraction domain, and hence is regarded as a low dose approximation to the equation, in which the intrinsic radiosensitivity of the cells is represented by the coefficient of lethal damage, a which is the initial slope of the survival curve. 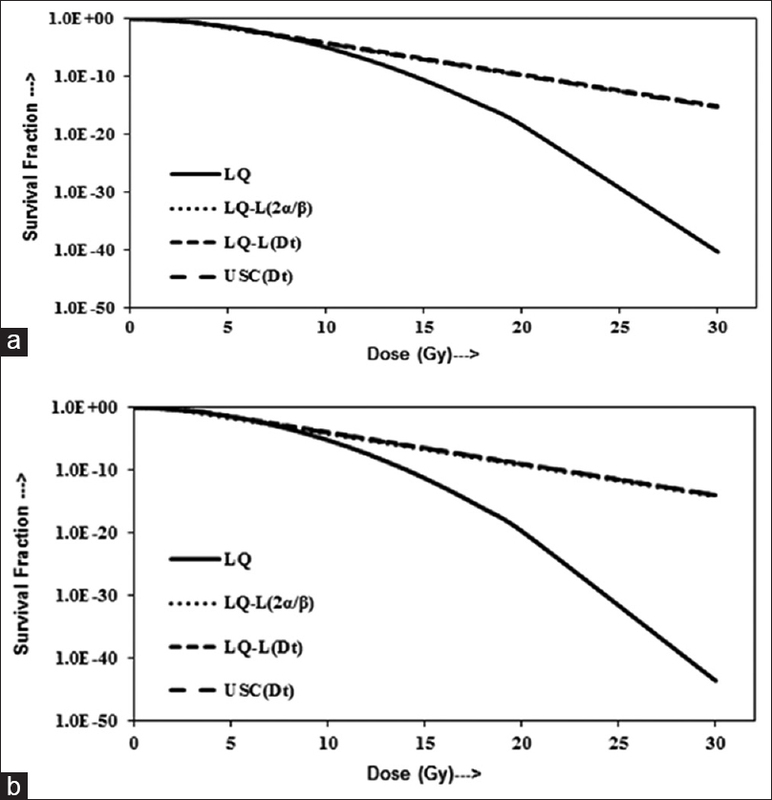 Beyond the LQ model dose fraction domain, i.e. in the high dose fraction domain, an exponential function fit radiation cell survival data of most of the cell lines, and represented by the parameters, D0 and n–. In [Table 1], the LQ and radiation cell survival parameters for SC and NSC lines, differ than that in the original report, because of an inaccuracy occurred in the digitization of the data from the charts and the methods used by the authors., The parameters derived by Carney et al. employing linear regression analysis of the exponential region of the curve and Carmichael et al. derived by fitting to the LQ and single-hit, MT models using a program written by Albright. 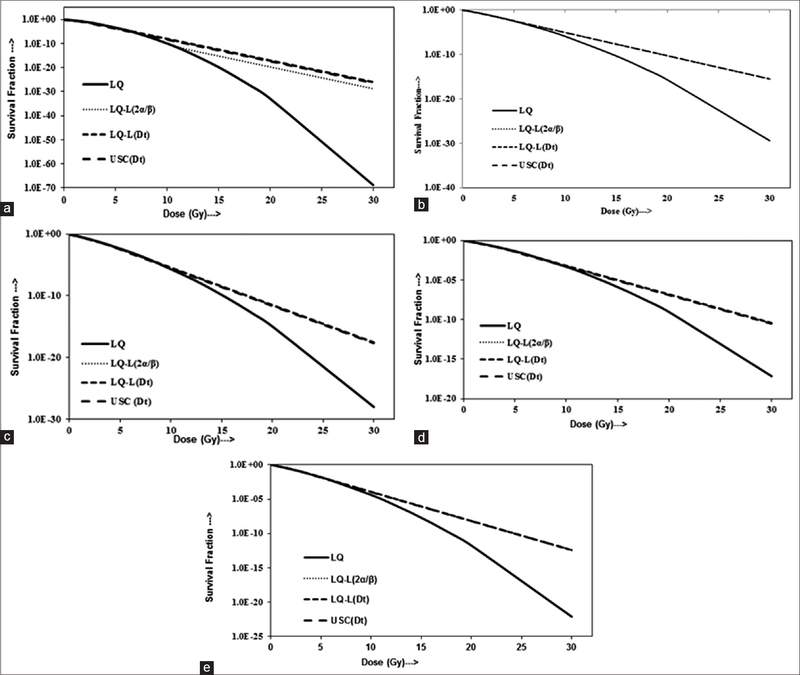 It is seen in [Table 1] that the radiation survival curves for the SC of Carney et al. 's charts  characterized by α, β, D0 and n– are considerably different than that of the counterpart SC of Carmichael et al. 's, except for NCI H 146. For NSC, comprising LC, Ad, AdSq and Sq cell lines, the survival curve for LC of Carney et al. 's data  characterized by α, β, D0 and n– are comparable to their counterparts in Carmichael et al's data. Intra-comparison of the parameters of Carmichael et al. data, show that the values for Ad are comparable with that of AdSq and Sq, except for NCI H 23 and NCI H 358. The values of α, β, D0, and n–, for each cell line, were used to calculate the values of Dt-2α/β and Dt[=(2D0 ln(n–))/(1-aD0)], for digitized data set of the reports,, which were further used to plot survival curves for the LQ, LQ-L, and USC models, and the comparison of the goodness of fit with the digitized and extrapolated survival data was performed using the Chi-square goodness test. The LQ parameters a and b for 6 cell lines, 4 SC (NCI H249, NCI H187, NCI H209, NCI H69) and 2 Ad (NCI H23, NCI H358), provide higher values of Dt-2α/β, than the dose range considered in this study, resulting in the LQ-L(Dt-2α/β) curves to superimpose on the LQ curves, shown in [Figure 1]b, [Figure 1]c, [Figure 1]d, [Figure 1]e and [Figure 5]a, [Figure 5]b. A close inspection of [Figure 1]a (NCI H146), 2a (NCI H69 classic), 2b (NCI H526 variant), 3b (NCI H417), 4a (NCI H157), 5d (A549), 6a (NCI H322), 6b (NCI H596), 6c (NCI H647), and 7b (NCI H520) make clear that when Dt-2α/β is close to Dt-mt, the LQ-L(Dt-2α/β) curve runs parallel to the LQ-L(Dt-mt) and USC(Dt-mt) curves. It has also been seen that as Dt-mt/Dt-2α/β ratio tends to reach 1, the LQ-L(Dt-2α/β) curve approaches close to the LQ-L(Dt-mt) curve. On the other hand, in [Figure 1]b (NCL H249) and 2a (NCI H69 classic), the USC(Dt-mt) curves superimposed on the LQ-L(Dt-mt) curves. In [Figure 2]b (NCI H 526 variant), 4a (NCI H157), 4b (NCI H46), 5a (NCI H23), 5d (A549), and 6c (NCI H647) the USC curves are slightly raised at Dt-mt, i. e. the value of survival fraction slightly increased at Dt-mt, and then progress parallel to the LQ-L(Dt-mt). [Figure 1]a, [Figure 1]b, [Figure 1]c, [Figure 1]d, [Figure 1]e, [Figure 2]c, [Figure 3]a, [Figure 1]b, [Figure 4]c, [Figure 5]b, [Figure 1]c, [Figure 6]a, [Figure 1]b and [Figure 7]a, [Figure 1]b show that the USC curves drop slightly at Dt-mt and then run parallel with LQ-L(Dt-mt) curves. It is clear from [Figure 1], [Figure 2], [Figure 3], [Figure 4], [Figure 5], [Figure 6], [Figure 7] that the LQ-L(Dt-mt) curves, for cell lines studied in this work, do not show any raise or drop at Dt-mt and transition smoothly to the linear asymptotic portion of the curve over the range of the dose fraction accounted in this study. Combined calculated values of α, β, D0 and n– parameters for SC and NSC cell lines for digitized data of both reports, of Refs 43 and 44, are compared with that of extracted from the reports, of Refs 44 and 45, and are shown in [Table 2]. The Student's t-test reveals that the calculated values of α, β, D0 and n– are not significantly different than that of the values obtained from the reports. Since, the Student's t-test illustrates no statistical difference between the parameters of two groups, the calculated values of α, β, D0 and n– are combined with that obtained from the reports, and the results are given in [Table 3]. The value of Dt-mt and D0[Table 3] are comparable, while values of α, α/β and n– are different from that reported by Wennberg and Lax  for lung tumors, which were of NSC taken from Park et al. Using resultant values of the parameter, the representative values the LQ and survival curve parameters, with calculated Dt-mt, are given in [Table 3]. [Figure 8] and [Figure 9] show the plots for the LQ, LQ-L(Dt-2α/β), LQ-L(Dt-mt) and USC(Dt-mt) models for representative values [Table 3] of α, β, α/β, D0, n– and Dt-mt, for SC and NSC cell lines, respectively. In [Figure 8] and [Figure 9], the LQ-L(Dt-mt) curves, for both cell lines, transition smoothly to asymptotic linear portion at Dt-mt, while the USC(Dt-mt) curves show slight increase in survival fraction at Dt-mt. In [Figure 8] the LQ-L(Dt-2α/β) curve follows the LQ curve, even after passing initial slope of the curve, and then transitions to a linear portion with a significant increase in survival fraction which makes it bi-phasic, due to considerably higher value of Dt-2α/β than Dt-mt. On the other hand, in [Figure 9], for NSC cell lines, the LQ-L(Dt-2α/β) curve drops at Dt-2α/β that brings it below the LQ curve, and then intersects the LQ curve. The steepness of the survival curves of these models varied considerably at dose per fraction above transition dose and LQ-L(Dt-mt) model showed smooth transition than the USC and the LQ-L(Dt-2α/β) models. For some of the cell lines, the USC model is slightly less sensitive compared to the LQ-L (Dt-mt) model, considerably less sensitive to the LQ-L(Dt-2α/β) and the LQ models at high fraction doses. The results of this study demonstrate that applicability of the transition dose Dt= 2α/β is valid only if its value is close to Dt-mt. Astrahan  discussed that the LQ-L(Dt-2α/β) curve using a simplification of the transition dose Dt= 2α/β can only be applied where there is smooth and gradual transition of the LQ curve to asymptotic linear portion. To evaluate relative difference between the LQ, LQ-L(Dt-mt) and USD(Dt-mt) models for fractionated SBRT, the BED and EQD2 were calculated for the dose scheme used by the RTOG 0813 protocol from level 1 to level 9 varying from 8 Gy to 12 Gy per fraction delivered in 5 fractions. The values of BED and EQD2 calculated using the LQ, LQ-L(Dt-mt) and USD(Dt-mt) models, for SC and NSC lung cancers, for representative parameters [Table 3], show that for the RTOG 0813 dose levels, the BED (or EQD2) calculated by the LQ model gives unrealistic dose potency that varied from 1.05 to 1.22 times for SC lung cancer, and from 1.02 to 1.16 times for NSC lung cancers, higher than that calculated by the LQ-L(Dt-mt) model. The BED (or EQD2) of LQ model was higher by 1.1 to 1.44 times for SC and by 1.05 to 1.24 times for NSC lung cancers than that calculated by the USC(Dt-mt) model. 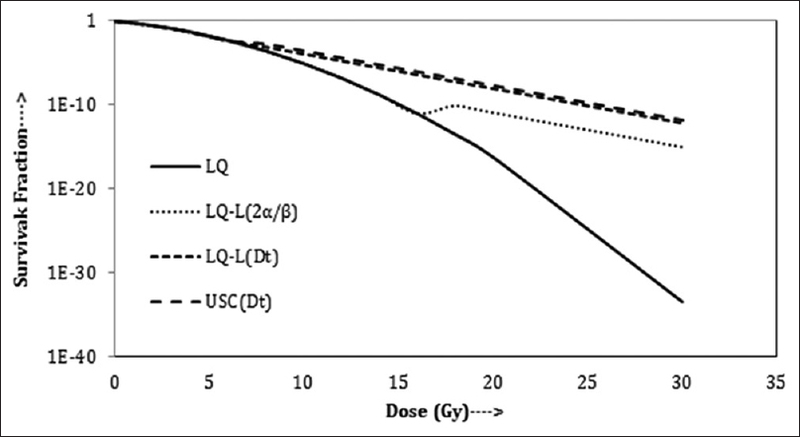 Similarly the values of BED (or EQD2) calculated by the LQ-L(Dt-mt) were 1.10–1.18 and 1.03–1.107 times higher than that calculated by the USC(Dt-mt) model for SC and NSC lung cancers, respectively. 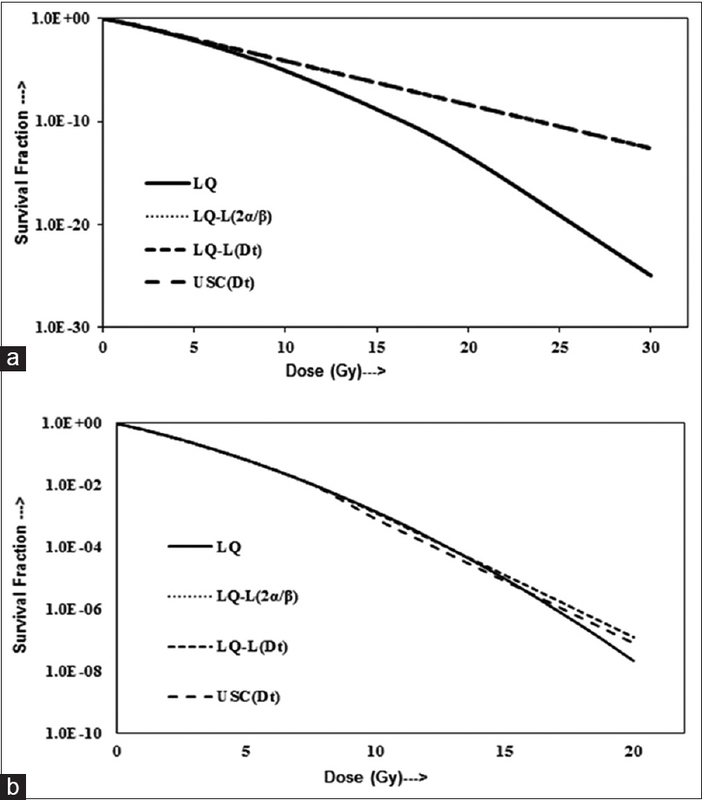 It is seen in the [Table 4] that the LQ model grossly overestimates the BED (or EQD2) for large dose per fraction treatment, and is likely flawed. 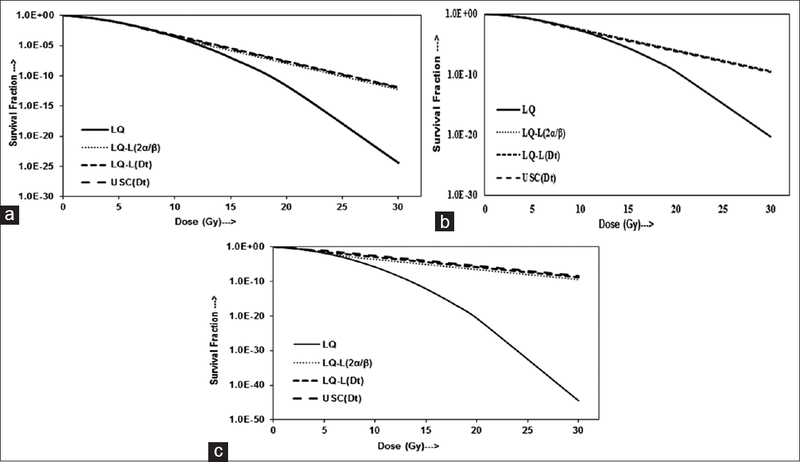 The comparison between LQ-L(Dt-mt) and USC(Dt-mt), shows that the calculated survival fraction and BED (or EQD2), for RTOG 0813 dose scheme, is less sensitive for the USC(Dt-mt) model and does not transition smoothly and gradually from the LQ model to asymptotic linear portion compared to the LQ-L(Dt-mt) model. At the same time the USC(Dt-mt) is unable to address radiobiological issues associated with SBRT treatment. The LQ-L(Dt-mt) model provides best fit with smooth and gradual transition of the LQ model to linear portion of the survival curve at transition dose Dt-mt. The Dt-mt describes the dose at which the LQ model loses its validity and final linear portion of the curve begins. The fitting of the experimental dose response data in the range of high doses, used in SRS and SBRT, to the LQ, LQ-L(Dt-2α/β), LQ-L(Dt-mt) and USC(Dt-mt) models illustrates that the LQ-L(Dt-mt) model provides the best explanation of the problem. On the other hand, the LQ model overestimates the severity of response at high doses due to continuous bending of the curve, while the LQ-L(Dt-2α/β) and USC(Dt-mt) models do not transition smoothly to the linear portion of the curve. Results of this study show that the LQ-L(Dt-mt) model is able to fit wide variety of cell survival data over a very wide range of doses. The transition dose Dt-mt and final slope g, the loge cell kill per unit dose in the final linear portion of the survival curve, can be calculated using D0 and obtained by the best fit exponential regression of experimental or multi-fraction dose response data. Plots of this study show that the LQ-L(Dt-mt) model offers a best description of the cell survival data for SC and NSC cell lines in the high dose region well beyond the shoulder. With the LQ-L(Dt-mt) model, the LQ model retains its all strengths in the low-dose range. The results of this study demonstrate that the LQ-L(Dt-mt) would be the greatest clinical tool for intercomparison of conventional and hypofractionated treatment schemes. Withers HR. Biologic basis for altered fractionation schemes. Cancer 1985;55:2086-95. Ang KK, Peters LJ. Principles and practices of oncology. PPO Updates. 1994;4:1-15. Douglas BG, Fowler JF. The effect of multiple small doses of x rays on skin reactions in the mouse and a basic interpretation. Radiat Res 1976;66:401-26. Wolbarst AB, Chin LM, Svensson GK. Optimization of radiation therapy: Integral-response of a model biological system. Int J Radiat Oncol Biol Phys 1982;8:1761-9. Yaes RJ, Kalend A. Local stem cell depletion model for radiation myelitis. Int J Radiat Oncol Biol Phys 1988;14:1247-59. Amichetti M, Orrù P, Madeddu A, Murtas R, Carau B, Farigu R, et al. Comparative evaluation of two hypofractionated radiotherapy regimens for painful bone metastases. Tumori 2004;90:91-5. Tong D, Gillick L, Hendrickson FR. The palliation of symptomatic osseous metastases: Final results of the study by the Radiation Therapy Oncology Group. Cancer 1982;50:893-9. Madsen EL. Painful bone metastasis: Efficacy of radiotherapy assessed by the patients: A randomized trial comparing 4 Gy X 6 versus 10 Gy X 2. Int J Radiat Oncol Biol Phys 1983;9:1775-9. Lutz ST, Chow EL, Hartsell WF, Konski AA. A review of hypofractionated palliative radiotherapy. Cancer 2007;109:1462-70. Ampil FL, Unger JB, Caldito G, Charrier A. Definitive and palliative radiotherapy for cervix cancer in the elderly. Eur J Gynaecol Oncol 2006;27:115-8. Arcangeli G, Giovinazzo G, Saracino B, D'Angelo L, Giannarelli D, Arcangeli G, et al. Radiation therapy in the management of symptomatic bone metastases: The effect of total dose and histology on pain relief and response duration. Int J Radiat Oncol Biol Phys 1998;42:1119-26. Leksell L. Sterotaxic radiosurgery in trigeminal neuralgia. Acta Chir Scand 1971;137:311-4. Leksell L. Occasional review: Stereotactic radiosurgery. J Neurol Neurosurg Psychiatr 1983;46:797-803. Potters L, Kavanagh B, Galvin JM, Hevezi JM, Janjan NA, Larson DA, et al. American Society for Therapeutic Radiology and Oncology (ASTRO) and American College of Radiology (ACR) practice guideline for the performance of stereotactic body radiation therapy. Int J Radiat Oncol Biol Phys 2010;76:326-32. Hall EJ, Brenner DJ. The radiobiology of radiosurgery: Rationale for different treatment regimes for AVMs and malignancies. Int J Radiat Oncol Biol Phys 1993;25:381-5. Song CW, Kim MS, Cho LC, Dusenbery K, Sperduto PW. Radiobiological basis of SBRT and SRS. Int J Clin Oncol 2014;19:570-8. Withers HR. The 4R's of radiotherapy. In: Lett JT, Adler H, editors. Advances in Radiation Biology. Vol. V. New York: Academic Press; 1975. p. 241-5. Hall EJ. Time, dose and fractionation. In: Radiobiology for the Radiologist. 5th ed. New York: Lippincott Williams Wilkins; 2000. p. 397-418. Barendsen GW. Dose fractionation, dose rate and iso-effect relationships for normal tissue responses. Int J Radiat Oncol Biol Phys 1982;8:1981-97. Dale RG. The application of the linear-quadratic dose-effect equation to fractionated and protracted radiotherapy. Br J Radiol 1985;58:515-28. Fowler JF. The linear-quadratic formula and progress in fractionated radiotherapy. Br J Radiol 1989;62:679-94. Joiner MC, Bentzen SM. Fractionation: The linear-quadratic approach. In: Joiner M, van der Kogel A, editors. Basic Clinical Radiobiology. London: Hodder Arnold; 2009. p. 102-19. Dale R. Use of the linear-quadratic radiobiological model for quantifying kidney response in targeted radiotherapy. Cancer Biother Radiopharm 2004;19:363-70. Astrahan M. Some implications of linear-quadratic-linear radiation dose-response with regard to hypofractionation. Med Phys 2008;35:4161-72. Puck TT, Marcus PI. Action of x-rays on mammalian cells. J Exp Med 1956;103:653-66. Park C, Papiez L, Zhang S, Story M, Timmerman RD. Universal survival curve and single fraction equivalent dose: Useful tools in understanding potency of ablative radiotherapy. Int J Radiat Oncol Biol Phys 2008;70:847-52. Guerrero M, Li XA. Extending the linear-quadratic model for large fraction doses pertinent to stereotactic radiotherapy. Phys Med Biol 2004;49:4825-35. Carlone M, Wilkins D, Raaphorst P. The modified linear-quadratic model of Guerrero and Li can be derived from a mechanistic basis and exhibits linear-quadratic-linear behavior. Phys Med Biol 2005;50:L9-15. Wennberg BM, Baumann P, Gagliardi G, Nyman J, Drugge N, Hoyer M, et al. NTCP modelling of lung toxicity after SBRT comparing the universal survival curve and the linear quadratic model for fractionation correction. Acta Oncol 2011;50:518-27. Kiefer J, editor. A repair fixation model. In: Quantitative Mathematical Models in Radiation Biology. New York: Springer-Verlag; 1988. Haynes RH. The interpretation of microbial inactivation and recovery phenomena. Radiat Res Suppl 1966;6:1-29. Laurie J, Orr JS, Foster CJ. Repair processes and cell survival. Br J Radiol 1972;45:362-8. Reddy NM, Mayer PJ, Lange CS. The saturated repair kinetics of Chinese hamster V79 cells suggests a damage accumulation – Interaction model of cell killing. Radiat Res 1990;121:304-11. Sontag W. A cell survival model with saturable repair after irradiation. Radiat Environ Biophys 1987;26:63-79. Goodhead DT. Saturable repair models of radiation action in mammalian cells. Radiat Res Suppl 1985;8:S58-67. Tym R, Todd PW. The sensitization by iododeoxyuridine of cultured human cells to the lethal effect of x-rays and heavy ions. Int J Radiat Biol Relat Stud Phys Chem Med 1964;8:589-603. Carney DN, Mitchell JB, Kinsella TJ. In vitro radiation and chemotherapy sensitivity of established cell lines of human small cell lung cancer and its large cell morphological variants. Cancer Res 1983;43:2806-11. Carmichael J, Degraff WG, Gamson J, Russo D, Gazdar AF, Levitt ML, et al. 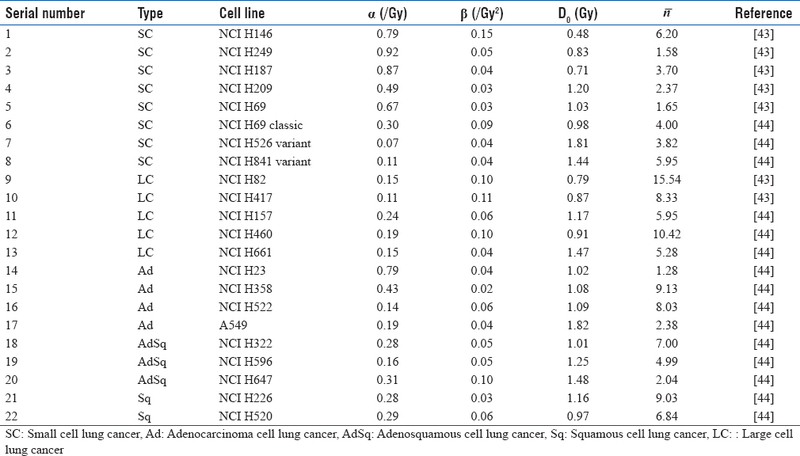 Radiation sensitivity of human lung cancer cell lines. Eur J Cancer Clin Oncol 1989;25:527-34. Krarup M, Poulsen HS, Spang-Thomsen M. Cellular radiosensitivity of small-cell lung cancer cell lines. Int J Radiat Oncol Biol Phys 1997;38:191-6. RTOG 0813. Seamless Phase I/II Study of Stereotactic Lung Radiotherapy (SBRT) for Early Stage, Centrally Located, Non-Small Cell Lung Cancer (NSCLC) in Medically Inoperable Patients. Available from: http://www.rtog.org. [Last accessed on 2016 Dec 15]. Biade S, Stobbe CC, Chapman JD. The intrinsic radiosensitivity of some human tumor cells throughout their cell cycles. Radiat Res 1997;147:416-21. Albright N. Computer programs for the analysis of cellular survival data. Radiat Res 1987;112:331-40. Wennberg B, Lax I. The impact of fractionation in SBRT: Analysis with the linear quadratic model and the universal survival curve model. Acta Oncol 2013;52:902-9.